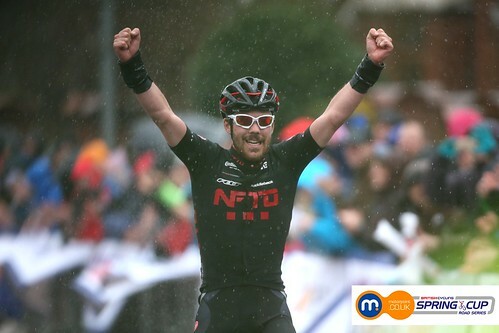 Edmund Bradbury (NFTO) drew first blood in the Motorpoint Spring Cup Series, taking the win in a wet and windy Chorley Grand Prix on Easter Saturday. The 23-year-old from Banstead in Surrey time trialled his way to victory over the last few miles, and despite the pouring rain and strong winds on the exposed Lancashire course he made victory look easy, crossing the line around 30 seconds ahead of team-mate Dale Appleby, with Dexter Gardias (Pedal Heaven) third. Bradbury is a superb time trial rider, and placed second to Alex Dowsett in the time trials at the 2015 British Cycling National Road Championships. Most recently he was second in the Wally Gimber Trophy a fortnight ago, proving that he can ride successfully in road races too. But both he and NFTO had to bide their time towards the end of the 116-mile race before making their decisive move. As the race rolled out of Chorley the rain began to come down heavier, and as they powered towards the first climb of Rivington Pike several riders made a bid for freedom. They were helped by some crashes which split the field, and as they crested the top of the climb it was Ian Wilkinson (Pedal Heaven RT) and Ben Hetherington (Planet X-Northside Cycling) who got clear. They worked hard to get clear, and after ten minutes they were joined at the front by Rob Partridge (NFTO). With added impetus, the trio established a lead of over a minute. As they hurtled towards the end of the first lap, their lead had grown to around 1-15 over the bunch, but two riders attempted to chase – Tommy Bustard (Metaltek-Kuota) and Jez McCann (Richardsons-Trek). Heading into the second lap, the three leaders had around 45 seconds as they tackled Rivington climb again, while behind them the chasing few had been pulled back by the bunch. Their lead steadily dropped until it was around 25 seconds, and they were now within sight of the bunch on longer stretches. Stephen Swindley (PMR at Toachim House) bridged across to make the leading group four-strong, but it did little to help them stay clear as JLT Condor drove hard on the front of the bunch. The third ascent of Rivington loomed, and as the leaders pulled themselves up it they were finally swallowed up by the chasers after around two hours of freedom. After one or two solo attacks came to nothing, a large break of 12 riders formed, with many of the big teams represented. Pedal Heaven RT had four riders up there in Jack Pullar, James Gullen, Max Stedman and Grant Ferguson, but NFTO featured Ian Bibby and Ed Bradbury. Raleigh GAC had Craig Wallace and Adria Moreno Salo, Metaltek-Kuota’s Dan Fleeman and Adam Kenway were present, as were JLT Condor duo Steve Lampier and Stephen Williams. They quickly gained 45 seconds over the bunch, but just when it was looking likely to stay away the bunch pulled them back again. With around two and a half hours gone, Connor Swift (Envelopemaster-Giant Sheffield) and Jonny McEvoy (NFTO) got around 30 seconds clear. Of the several chasers, they were eventually joined at the front by Dexter Gardias (Pedal Heaven) and Daniel Patten (Team Wiggins). Their lead hovered around 25 seconds with Madison Genesis keen to push the chase on and stop them from escaping. A successful chase was eventually mounted, and they swelled the lead group to 11 riders with McEvoy, Swift, Patten and Gardias being joined by Steve Lampier (JLT Condor), Gruffydd Lewis (Madison Genesis), Ed Bradbury, Dale Appleby and James Lowsley-Williams (NFTO), Rhys Howells (Richardsons Trek) and Craig Wallace (Raleigh GAC). On the final climb of Rivington, James Lowsley-Williams jumped away and was quickly joined by Lampier, Gardias and Appleby, and with others struggling to stay in touch, the break was down to eight riders by the top of the climb. As they crested the climb for the final time, Bradbury attacked and quickly gained crucial daylight. Lampier reacted but couldn’t hold close to his wheel. With little more than a minute in front Bradbury had opened up a lead of 12 seconds over Lampier, with Appleby and Gardias at 28 seconds. He adopted a classic time trial pose and looked determined to solo to victory as his lead grew to 28 seconds, despite the weather worsening. At the line he was over 30 seconds clear, with team-mate Appleby taking second from Gardias in third. “I’m over the moon, I couldn’t believe it,” said Bradbury. “I went with about 20 kilometres to go and really had to dig deep. I kept getting time checks in the last two kilometres saying I had 30 seconds lead so I probably had enough time to sit up, but I just kept going because I didn’t want to risk it. “Today was all about the team effort. We were looking to last year’s winner Ian Bibby a lot, and I think all the other teams were looking at him which gave the rest of us a bit more lee-way. But we ended up with so many riders in the break it shows how strong the team is this year. “It got absolutely grim towards the end, but when you’re going full gas you hardly notice it. We’ve got such good kit on this year. We were staying dry as best as we could but in the last 4-5 kilometres it was absolutely biblical!